Do you have a nickname? Everyone calls me Kate, but my real name is Kathryn. When and why did you first become interested in gymnastics? I used to play a game where I would jump off of my stairs and every time I would land on my feet, I would go up one stair higher. Because of this, my mom signed me up for a gymnastics class, and I have loved the sport ever since. Do you have any good/funny memories from when you first started taking gymnastics classes? In kindergarten, instead of listening to my coach, I was usually goofing around/doing my own thing with my friend. When did you decide you wanted to compete? And, when did you want to compete at a high level? What about competition appeals to you? When we reach a certain level at my gym, we try out competing to see if we like it, which I did. I love the feeling of nailing a routine and hitting 4 for 4. What is your training regimen? I train 32.5 hours per week. What is your favorite skill? Full out dismount on bars. How have you grown as a gymnast during your career, both skill wise and mentally? Over the course of my career, I have learned many new skills on each of the events. Mentally, I have learned how to control my emotions when things aren’t or haven’t been going my way. How has gymnastics helped you as a person? I have learned the importance of time-management, hard-work, dedication, and mental stamina. If you had to select one life-lesson that gymnastics has taught you, what would it be? Gymnastics has taught me the importance of staying calm in a crisis and to always look on the bright side of situations. What are your biggest accomplishments or best memories in your career? 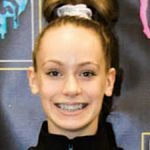 Qualifying to the 2017 JO National Championships, qualifying to the 2018 Nastia Cup, and verbally committing to the University of North Carolina. What grade are you in school, and where do you go to school? I am in 10th grade. I do online school with North Carolina Virtual Public High School. What are your favorite subjects, etc.? I love Biology and pretty much anything in the science field. If you plan to go to college, do you know what you want to study there? I want to study something that will help me get into physical therapy school. What are your goals for the future, both as an athlete and after you are finished competing? I want to compete gymnastics in college and have a job in Physical Therapy. When you’re not in the gym, how do you enjoy spending your time? Do you have any hobbies or favorite activities? I enjoy doing crafts, painting my nails, hanging out with my friends, and reading. Are any of your family members current or former athletes? Which sports? My mom played softball, and my dad played basketball. Do you have any competition rituals? Lucky charms? I have a pair of blue, grey, and white lucky socks with a huge hole on the bottom of the right one. What’s on your IPod right now? What type of music do enjoy listening to? How about before a meet when you’re trying to get focused and pumped up? I like listening to pop. I don’t usually listen to music before meets. If you had to pick 3 words to describe yourself as a gymnast, what are they? Hard-working, dedicated, and supportive.